ESP joins the relic/artist model fray in a most aggressive fashion with this robustly distressed George Lynch 56 model. ESP also has a Vintage Series of S-type aged models. "Here is a very cool 2007 ESP GL-56 George Lynch guitar with a distressed 2 tone sunburst finish. 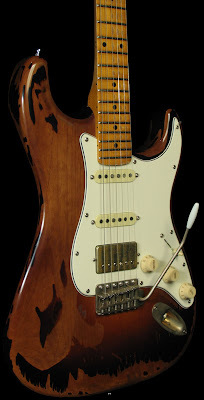 The guitar is a strat-style piece with an alder body, one piece maple neck, Gotoh vintage bridge, Sperzel locking tuners, and a Duncan Pearly Gates humbucker. It has a distressed paint job to give a vintage vibe and that played-in look. This is a pre-owned 2007 model and it is in excellent condition. It has seen virtually no playing time. This guitar is made in Japan. It ships in the original hardshell case and includes the trem arm... We take great care in conveying the condition of each item we sell, and every instrument is inspected thoroughly prior to auction. 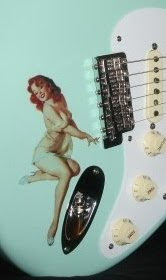 The truss rod, electronics, frets, tuners, structural integrity, finish condition, originality, and all other parts and aspects of the instrument are addressed before the item is deemed acceptable for sale..."
Visit the Zoo for more several more pics of this unit, before they sell it.